All eyes on her! 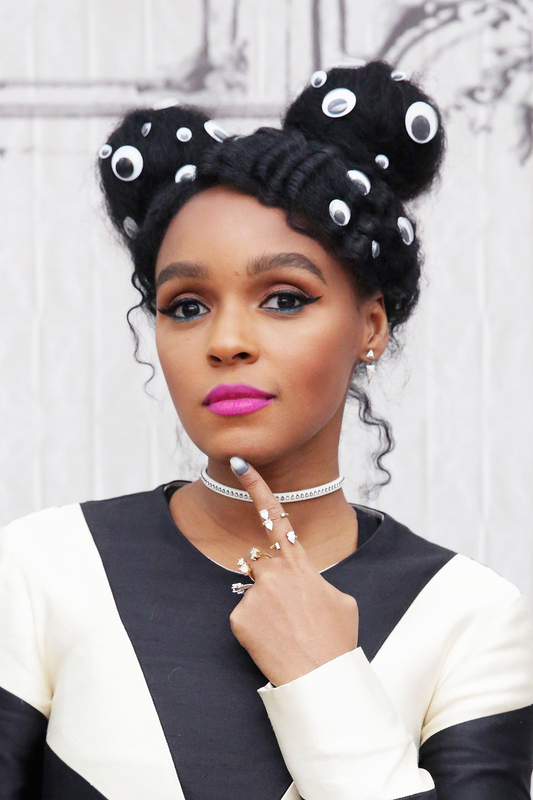 Janelle Monae debuted a, well, eye-conic hairstyle while promoting her new film, Hidden Figures, in New York City on Tuesday, December 20. Get the details on her head-to-toe style in today’s Red Carpet Daily, presented by DirecTV. Monae, who’s known for her uniform of black and white, didn’t disappoint in a long-sleeved black and white, pinwheel-style Bally shift teamed with Christian Louboutin studded heels and a Liv Bambina silver choker complemented by simple Fallon Jewelry earrings. But what really caught our — you know — was her hair: double buns and a swoop studded with googly eyes all over, as styled by pro Nikki Nelms. Fun fact: Nelms also assembled some of Solange’s stunning A Seat at the Table ‘dos, including her beaded braids from the “Don’t Touch My Hair” video. “’EVEN WHEN I&apos;M SLEEPING I KEEP 20 eyes open,’” the “Tightrope” singer, 31, captioned a December 20 Instagram selfie. Keep watching Red Carpet Daily for more black and white style from Jessica Alba, who went a prim and proper route for an event in Los Angeles.